Those sentiments resonate throughout No Country For Old Men, at least among the morally upstanding few, who are left to wonder, as McDormand did, what to make of a world overcome by violence. As Tommy Lee Jones’ sheriff points out, he’s the third generation in his family to watch over this formerly quiet country in Texas, and first two didn’t even carry weapons, much less have cause to use them. 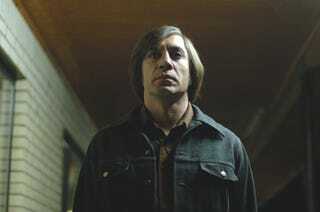 Suffice to say, that isn’t the case in this exceptionally bloody story, which like Fargo boils down to money—a lot of it, connected to a $2 million drug deal gone wrong, the cagey local (Josh Brolin) who stumbles on the loot, and the relentless, utterly terrifying psychopath (Javier Bardem) who’s hot on his trail. It makes for a hell of a morality play, not to mention the most gripping thriller in recent memory.